Despite the Nelson County Planning Commission’s unanimous recommendation (in June of 2016) to the Nelson County’s Board of Supervisors that they amend Nelson County’s Floodplain Ordinance to adopt crucial Higher Standards as recommended by The Federal Emergency Management Agency/National Floodplain Insurance Program, there is a distinct lack of action from the Board. Please call your Supervisor and urge them to take action! Click here for contact information for the Nelson County Board of Supervisors. 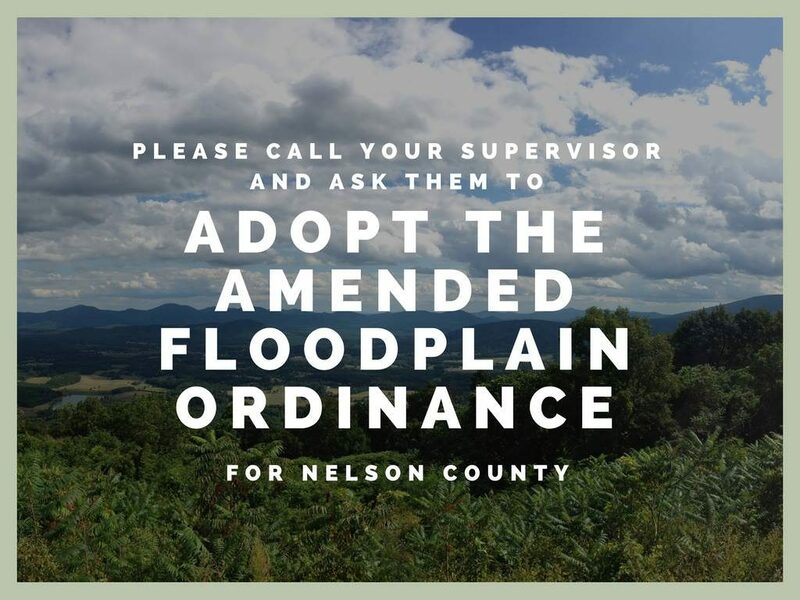 If you are a resident of Nelson County and haven’t already signed our petition urging the Board to act on the amended flood plain ordinance, please take the time to do so. The proposed amendments to the floodplain ordinance would give Nelson County the opportunity to lower floodplain insurance for its homeowners and business owners and would prohibit critical facilities, hazardous materials, and non-native fill in special flood hazard areas. Nelson County has six out of the eight “High Risk Flood Hazard Areas” defined by the American Society of Civil Engineers, including areas that are susceptible to flash flooding, mudslides, erosion, alluvial fans, ice jams, and high velocity flows, making it imperative that our Board of Supervisors take prudent action to protect Nelson County by adopting the amendments to our Floodplain Ordinance. You can read the proposed amendments in their entirety by clicking here. This entry was posted in Environmental Impact, Nelson County Board of Supervisors, Take Action on March 7, 2017 by Meredith Ackroyd.